I sat motionless as I watched the tears fall unbidden down her cheeks. As her head fell forward and her chin slumped to her chest, she let out a long sigh...the kind of sigh that exhales weeks of bottled-up emotion. I couldn't tell whether she was trying to hide her gaze out of sadness or embarrassment...maybe a little of both. Her three kids had been the "naughty" ones at church...AGAIN...and she felt like a failure. She had gotten the sidelong glances and awkward stares from folks bent on proving that this whole "homeschooling thing" was a huge mistake. But, it wasn't supposed to be this way. Weren't homeschool kids the "good" ones? Isn't that why she chose homeschooling in the first place...so that HER kids would turn out different than all those OTHER ones? is that homeschooling is not a savior. That's a myth that she had come to believe...a lie that had wormed its way into her truth. And now, because things did not seem to be turning out as she had hoped, she was beginning to think that maybe all those folks were right--maybe this homeschooling thing was a huge mistake. They imprison you with self-doubt...with failure...with hopelessness. But the truth will always set you free! You may have believed the myth. Now it's time to take hold of the truth. Myth #1-Homeschooling kids are always "good" kids. Truth: We are all imperfect people living in an imperfect world. That includes our kids. They are going to make wrong choices. They are going to misbehave. They are going to sin. Even in public. So often when our kids misbehave, we, as homeschooling moms, see their poor choices as a reflection of us...of our ability to parent, to homeschool, to fill-in-the-blank. Suddenly their "failures" become our failures. But what we can easily forget is that sinners will sin. Even homeschooled kids. Myth #2-Homeschooling is a savior. Truth: So often, homeschooling parents rank homeschooling as the answer to everyone else's problems. As homeschooling moms, we can see a friend's public-schooled child falter socially, spiritually, or academically and pridefully announce that homeschooling is the answer...the quick fix that will right every wrong. We see our "perfect" curriculum and our "perfect" methods and our "perfect" well-ordered plan and begin to prescribe it to all our friends and their "obviously-in-need-of-change" children. We place homeschooling on the throne of God and forget that change...true life-altering change...comes only through Him. He changes hearts...and He can do it with or without homeschooling. 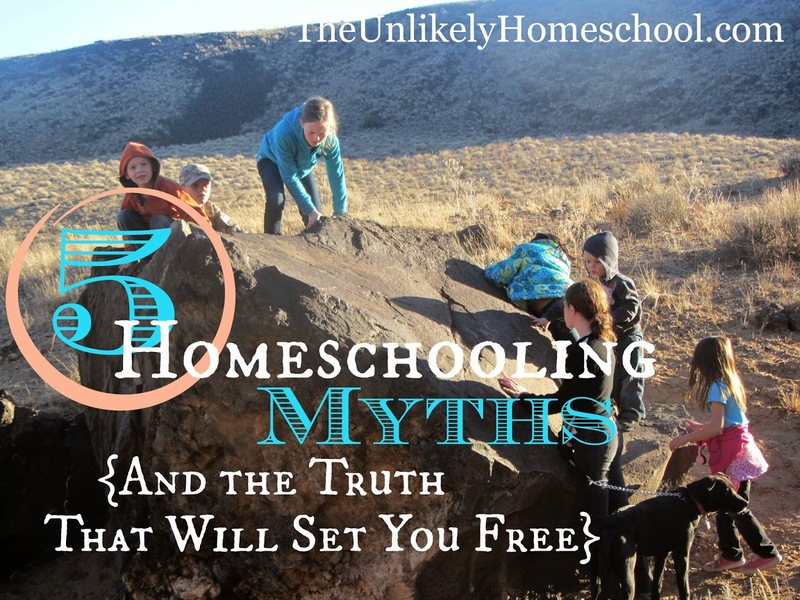 Myth #3-Homeschool mothers always like homeschooling. Truth: While I love homeschooling, I don't always like it. But, I would venture to say that this is true of any life choice. When I was a working mom years ago, I had plenty of I'd-rather-be-at-home days. Then, when I became a stay-at-home-mom, I fell victim to the please-someone-peal-these-children-off-of-me-for-a-few-hours kind of days. Because that's the nature of nature...the grass always looks greener in your neighbor's yard...especially on hard days. But my occasional longing look over the fence didn't mean I didn't love my job when I was working or that I didn't love my kids when I wasn't. It just meant that sometimes the days were hard. Really H.A.R.D. Now, as a homeschooling mom, there are days when I don't like homeschooling...when I want to flag down the driver of the big yellow bus and sneak four kids through the back emergency exit. But, on those days...on those really H.A.R.D. days, I cling to the Truth God grants me each year and know that His mercies will be new the next morning. And they always are. Myth #4-Homeschooling mothers have to have it all together. Truth: My children get to see my daily ugliness...and I theirs. It is one of the many blessings of homeschooling. They get to see my flaws day in and day out. They know I don't have it all together...far from it. There's no escaping the truth of my depravity...as a wife, as a mother, as a child of God. The awful truth of ME is left open and exposed for them more times than I care to admit. But, that truth is a gift. If I could somehow hide all my imperfections from them...if I could masquerade as one of those have-it-all-together mommas for even a day...I would show them a woman who has no need for a Savior. I'd be a momma pointing them in the wrong direction. "He drew me up from the pit of destruction, out of the miry bog, and set my feet upon a rock, making my steps secure." Myth #5-Homeschooling is the "perfect" way to educate. Truth: Homeschooling, like ALL educational paths, has its flaws. It comes with a lengthy list of struggles and successes. But, while homeschooling might not be the "perfect" choice, it might be the perfect choice for you. In other words, the unavoidable pros and cons of homeschooling might be exactly what God wants to use to purify and refine your children...and you. And because of that...because He is able to use even broken things to make something beautiful...homeschooling can be perfect for all those who are called to it. On that day...that very fateful is-homeschooling-just-a-big-mistake day...I took hold of her hand and filled it with truth. The myth was just too heavy for her to hold any longer. Well written. I always tell people that homeschooling is right for our family, but not everyone. Now, we even have a child in school who just couldn't cope at home because of a severe mental health problem. I am not sure school is the right place for her either, but it was obvious that homeschool did not have all of the services that she needed. I say that same thing. Glad I'm not the only one. I usually say, "These are just the struggles and successes that God wants me and my kids to have." You are so welcome. Sometimes I need the reminder too! God knew that I really needed to see this today! Just a little while ago I was thinking, 'I've been homeschooling for twenty years, why can't I get it right?' Thank you for the reminders. I know that as long as I stay on the path that God has set for me and my family and keep trying then I am not a failure. So right. So true, Melissa. Keep on going, Momma! You can never fail when you are right in God's plans. It helps me to remind myself why we homeschool-- it wasn't to have the most intelligent kids in the city or perfect kids. We made this decision based on God's Word and the gifts he's given us, as parents, to be able to train our children in light of Him. I think it is so important to recognize WHY you have chosen to homeschool. That reason should direct all your homeschooling decisions and bolster you when you feel discouraged. Great reminder, thanks! Amen! I always love your honesty and humility, Jamie. Thanks for reading, Lindsey. You're always such a big encouragement! I have been reading your blog for a long time and have never commented. However, this was too good to not comment. Thank you Jamie for a beautifully written and honest post! Thank you so much for the encouragement, Rachel! I'm glad you enjoyed it. As I begin my twentieth year of homeschooling it is nice to see at least these myths in print. :) It helps me to know that I am not the only ones that feels this ways sometime or another. I encourage each and every mom to continue to look up and keep trusting God in your homeschool adventure and although they may mean well, politely ignore the "well meaning" nay sayers. Remember, it is God that is who we are accountable to and the one who carries us through each and every day. I hope everyone has a blessed school year.